This is the most common heating element found in hot tubs and spas and easy to replace. Suitable for heaters from Balboa, Gecko, HydroQuip, Thermocore, Aquatemp, RMF, Spabuilders and Brett Aqualine, but will fit most heater assemblies on hot tubs up to 15" long. This is a genuine USA made element from high quality incoloy 800 metal, making this the same spec as your OEM element. Comes supplied with new Viton seals and terminal nuts. 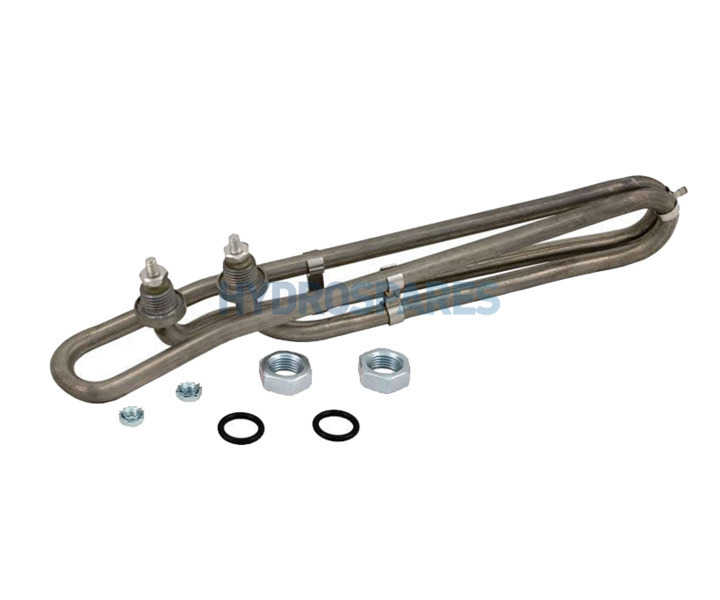 To remove a hot tub heating element push down on both elements and slide them straight out.It's also a good idea to replace the heater tube seals as well. Do not over tighten the element retaining nuts and the 10mm nuts holding the connections, these don't need a lot of torque. NEVER run you heater dry, always prime your heater before switching on. Usually a hot tub will only trip when power is sent to the element.Can be5 seconds after its switched on or after prime mode has ended. Always try the hot tub without the filter cartridge fitted, always check forforeign objects inside the filter bay. Withthe power of to the hot tub, disconnect the heaterelement. ISOLATE TERMINALS TO AVOID ELECTRICUTION.Turn the power back on, if the hot tub doesn't trip you have isolated that the fault is the element. Look for signs of corrosion around the seals in the heatertube, also look for water leaksaround the control pack.